Author: Jaroslav Dudík at DAMTP, University of Cambridge. Figure 1: Morphology of the flare during the rise phase. The observations shown here are in the AIA filter 131, where the flare signal is dominated by Fe XXI 128.7A line . The white dashed box denotes the region zoomed at in Figures 2 and 3. The energy release in solar flares is thought to occur via the process of magnetic reconnection. The reconnection itself usually happens in locations where the magnetic field mapping has discontinuities or strong gradients . However, in cases of the strong gradients in the field mapping, the reconnection does not happen via the usual “breaking and re-joining” of the magnetic field lines; rather, the field lines are seen to “slip” continuously in the quasi-separatrix layers . Although this slipping reconnection has been theoretically predicted since 1995 , there are almost no observational reports except . In particular, this process was never witnessed before in a solar flare. The X1.4 flare of July 12, 2012 was an eruptive, long-duration event. We observed apparent motion of the lower parts of the flare loops throughout the flare rise and impulsive phases (15:00 – 16:49 UT). The morphology of the flare were favourable during the rise phase, since the flare loops were visible in their entirety, i.e., the footpoints were not obscured (Fig. 1). This were not true during the gradual phase, when the arcade is much wider. 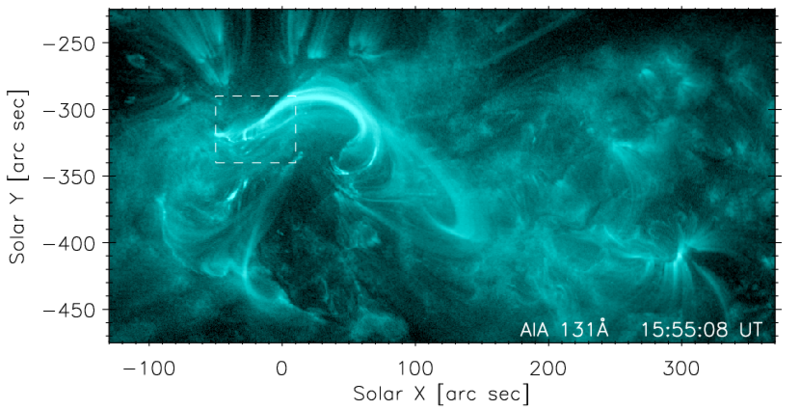 Figure 2: Apparent motion of the lower portions of the flare loops, in the AIA 131 filter. The observations reported here were performed by the Atmospheric Imaging Assembly  on board the Solar Dynamics Observatory. AIA observes the full Sun in multiple filters, capturing a snapshot with spatial resolution of 1-2 arc sec every 12 seconds. These high temporal and spatial resolutions are crucial in identifying the apparent slipping motion, as any instrument with coarser spatial resolution or lower cadence could easily miss this phenomenon. 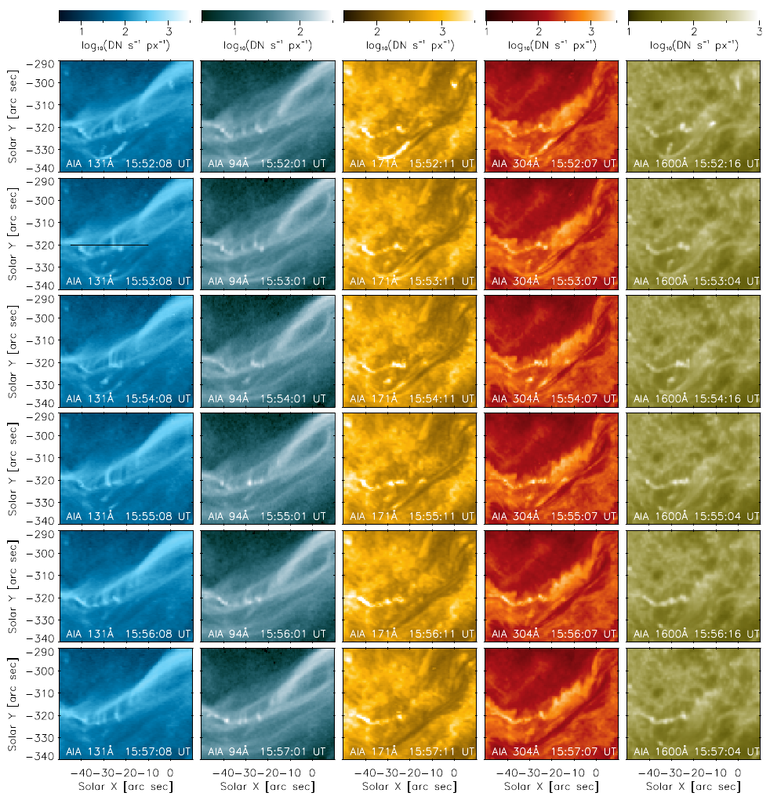 Figure 3: Snapshots of the lower portions of the flare loops, observed in (left to right) AIA 131, 94, 171, 304 and 1600. In AIA 131 and 94, the flare loops are visible. 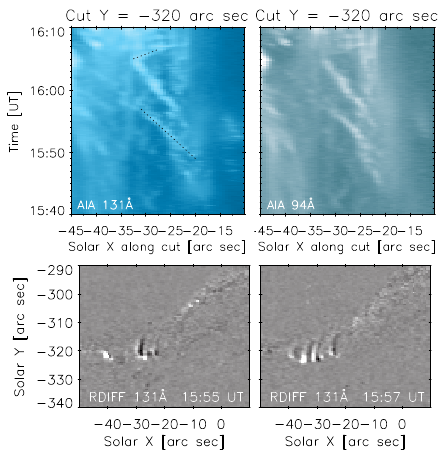 The black line in the AIA 131 image at 15:53 UT shows the location of the “cut” used to construct the time-distance stackplots in Figure 4. AIA 171, 304 and 1600 observations are dominated by the transition-region emission from the flare loop footpoints. This emission is the first sign of flare ribbons. The invisibility of the AIA 131 loops in AIA 171 means that the loops observed in AIA 131 have temperatures of about 10 MK. Figure 4: Time-distance stackplots along the artificial cut at Y = -320 arc sec (top) and running-difference AIA 131 images (bottom) show moving structures. The dotted lines in the top left image correspond to velocities of -16.6 km/s and +4.5 km/s, respectively. Sometimes, only one moving structure is visible (15:55 UT, bottom left), while at other times, there are several (e.g., 15:57 UT, bottom right). radiative (and conductive) cooling, whose timescales can be short for dense plasma. Therefore, the observed motion is likely an illusion created by successive brightenings of neighbouring loops, as well as the slipping motion of the magnetic field itself. The AIA observations are qualitatively well matched by the numerical MHD model of . This model recreates expansion of a torus-unstable flux rope during an eruptive flare. First published before the occurrence of this particular flare, the simulation was not intended to model any specific event. However, it allows us to fit the observations in terms of flare morphology. The simulation is pressureless (T=0), i.e., detailed analysis of the associated plasma response is not possible. In the simulation , magnetic field lines undergo multiple reconnections in the thinning current-sheet region within the quasi-separatrix layer  beneath the expanding flux rope. The local rotation of the magnetic field vector within the diffusion region induces apparent motion of the magnetic field lines. This motion is shown on Figure 5, where the footpoints of the field lines move predominantly in the negative-X direction, similarly as observed. Note the striking similarity of the field line morphology to that of the flare loops (Figures 2 and 3). The apparent slipping motion of the field lines, resulting from the slipping reconnection, would be coupled to plasma heating and chromospheric evaporation, producing an apparent motion of the flare loops. Figure 4: Evolution of the slipping magnetic field lines. The field line footpoints are fixed in the positive polarity (pink contours). With increasing time, the conjugate footpoints in the negative polarity (cyan contours) exhibit apparent motion along the intersection of the quasi-separatrix layer with the photosphere (grayscale background image). We observed apparent motion of the lower portions of the flare loops during the flare rise phase. The observed velocities are of the order of several tens of km/s. The morphology of moving loops and the direction of the motion is in good agreement with the predictions of the earlier numerical simulation of . This simulation includes slipping reconnection as a result of the erupting, torus-unstable flux rope. The slipping reconnection leads to apparent slippage of the field lines. More details can be found in .